When I moved to live near London a few years ago, one of my interests became the London Underground, the oldest and one of the busiest underground railway networks in the world. I'm not a train spotter by any means, but I find the history and background of London's subterranean railway fascinating. One of the things I find most interesting is the changing history of the railway, of which there is still much hidden evidence. For example, look through the window as you travel between Tottenham Court Road and Holborn on the Central Line and you'll see a station - where no passengers have alighted since 1932. This used to be British Museum station. Or perhaps you may notice the tunnel wall change from cast iron tubing to bricks as you travel on the Piccadilly Line between Green Park and Hyde Park Corner. This also used to be a station. Down Street, closed in the same year as British Museum. These stations are often referred to as ghost stations. There are about 40 abandoned or relocated stations on the Underground network along its entire 249 miles (402Km) of trackway - some subsurface and some above ground. Some have vanished without trace whereas others are almost intact, grimey time capsules of the era when they were closed. There are 4 visitors reading these pages at the moment including yourself. One point to note is that in these pages, all lines are referred by their contemporary names. Many if not all of the lines have however had different names during their existence. You can navigate this site in a number of ways. You can get to key pages by clicking on the menu bar at the top left of the page. Alternatively, at the bottom of most pages you'll also find a series of links to the main pages in text form. You may also decide to navigate the site by following the links within the nariative - indeed, many pages have been broken down into a series of smaller pages so that each individual page isn't too large for people browsing with a modem connection. The site has been designed with a resolution of 1024x768 or more in mind. It has however been designed to also work well in 800x600. In order to better understand the location of these stations on today's network, you may wish to download a copy of the world famous underground map (well, technically it's a diagram not a map), originally designed by Harry Beck in 1931 and first seen by the public in January 1933. This can be found in several formats on the Transport for London web site. Some people have asked me why I don't have a copy of the Underground map here, or more to the point, why I don't have a version of the map that shows the closed stations. I've explained this in more detail here. Since the majority of the stations that closed in central London were abandoned after 1930, a map of the railways as they existed in 1929, that's been annotated to show which Underground stations have closed or changed their name since that time is available. This page also includes some advertisements from the publication from where the map came from, showing how advertising style and standards have changed. Some people have had difficulty reading or seeing images on these pages. Admittedly some of the images are dark but all look presentable if the monitor is correctly set up. Here, you can find some test patterns I've generated to help you see these pages as I see them on my monitor! Several of the images found on these pages can also be found as interactive jigsaws! Click on the jigsaw pieces to have a try. Two major types of tunnels can be found on the London Underground. In the 19th century, digging deep level tunnels, especially under water was a dangerous and tricky business. Several attempts to cross the Thames had ended in failure, even with lives being lost. Brunell's Thames Tunnel (used today by the East London Line) was the first successful tunnel under the Thames but its construction was costly and very difficult. When it was discovered that steam traction could be replaced with electricity, tunnels could be dug that were much deeper. James Henry Greathead had devised a new method of tunnelling which employed compressed air to prevent leaking in conjunction with a circular drilling shield to bore circular tunnels (about 3 metres in diameter) much deeper into the ground, which were then lined with cast iron rings. When mining the soft north London clay however, the air pressure was hardly ever needed, as the clay is waterproof. Due to the speed at which these tunnels could be mined, many stations were envisaged on each of the lines that were created and most of these stations are still in use today. A small number however have fallen into disuse over the years. Take Aldwych for example, at the end of a disused railway siding right in the heart of London. Or Down Street, where the Railways Executive Committee were based and on rare occasions some of Winston Churchill's World War Two cabinet meetings were held when the Cabinet War Rooms were unavailable... or Brompton Road, used as a World War 2 anti aircraft Ack Ack command centre, with maps from this era still on the walls today! Evidence of these stations remains both on the surface and also beneath the ground if you know where to look. Click here to find out much more and to see photographs of some of these lost stations as they are today. Before the Greathead Shield was invented, most subterranean railways in London were built using the Cut and Cover technique. In many cases, this involved digging a deep cutting along the path of a road. The railway was laid in the trench and was then covered up with the road being re-laid above. These underground railways started out as extensions of some of the existing outlying railways and were initially served by steam locomotives and so many places were required where steam could be safely vented. Over the years, the need and use for some of these stations have changed with the result that some were closed. A careful observer can still see some today whereas others have completely vanished without trace. 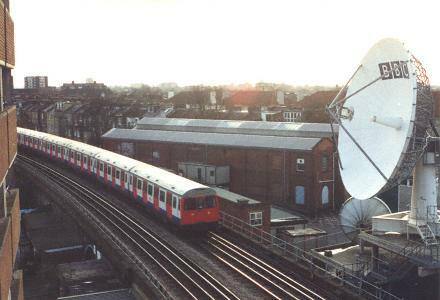 Click here to find out more about these lost stations. 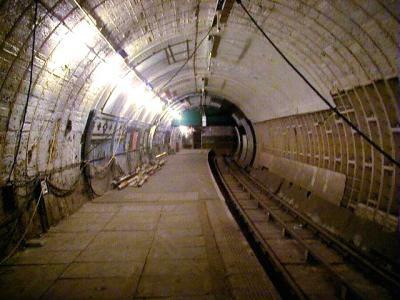 There are other parts of the Underground network that are in use today, but also contain abandoned tunnels and shafts. Click Here to find out what some of those disused passageways you see at some main stations are about. 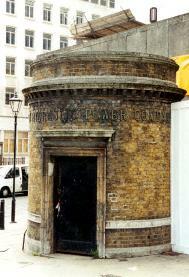 Although not strictly part of the Underground System, the Tower Subway was the world's first underground tube railway. Constructed using the revolutionary Greathead Shield invented by James Henry Greathead (used subsequently for many of the other tubes), the train (actually a single carriage) was cable operated and was effectively used as a shuttle service between the two banks of the Thames. The railway unfortunately was only open from August 2nd 1870 until November the same year due to very poor patronage. The tunnels were resurrected as foot tunnels but even this was short lived as they were again made redundant by the building of the nearby Tower Bridge in 1894 and were permanently closed to the public and the tunnels were equipped with pipes to provide hydraulic power. Today the tunnels are used as a conduit for water mains pipes and also for the transmission of fibre optic cables for computer networks across the Thames. The photograph above shows the small structure built over the northern shaft next to the Tower of London. Written around it are the words "A.D. 1868 LONDON HYDRAULIC POWER COMPANY", though this was not the original structure - the building seen today was built in 1926. You can click on the picture to see a bigger version. The aerial photograph shows the approximate location of Tower Subway's crossing of the Thames. The close proximity of Tower Bridge, the source of its eventual demise can clearly be seen. The south entrance to the Subway (to the left of the photograph) is now surrounded by a large building development but access to the subway is maintained so that engineers can service the pipes and communication cables. This picture was taken in 1999, just before construction work started on the City Hall building to the left of the picture. Not all of the rail tunnels under London were used by trains! The Kingsway Underpass was a cut and cover tunnel that ran the length of Kingsway starting just north of Holborn through Aldwych and ending under Waterloo Bridge and was expressly designed for the blossoming tram network in the early 20th century London. Find out more here! Well, not really a disused station at all of course, but Walford East is very familiar to viewers of a particular British television programme... Click here to find out more! The Bakerloo line used to run beyond Harrow & Wealdstone until quite recently (date to follow!). Maps exist today on the network that still show the line serving Headstone Lane, Hatch End, Carpender's Park, Bushey & Oxhey, Watford (High Street) and Watford. They're not abandoned though - the mainline service that follows the Bakerloo Line along its northern stretch has now taken over the operation of these stations. The section of the Metropolitan Line beyond Amersham has now been covered on the Cut & Cover pages. In the Scrap Book, I've included some of the photographs I took while researching the material found on these pages, but for one reason or another haven't found their way onto the final publication. ... Well, not quite. In What Can I See?, I've outlined how you can easily get to see some of the stations mentioned in these pages from the publicly accessible parts of the Underground. If you intend to try to see some of these places, this printer friendly page should prove useful. Aldwych Station: Some facts about Aldwych. Aldwych Tour: A description of a guided tour of Aldwych station. Hidden Holborn: A first hand behind-the-scenes look at some of the disused platforms at Holborn station. Down Street: Information about Down Street, used during World War 2 as a secret base. Down Street Tour: A description of a guided tour around Down Street station. Brompton Road: Brompton Road station - both a description of the station and of a visit. Wood Lane: Wood Lane Station. Bull & Bush: Bull & Bush station. Northern Heights Photo Gallery: includes HIghgate High Level platforms. Vauxhall Cross - the fictitious station in the James Bond film Die Another Day. Broadcasting House - a discussion about the rumour of a platform on the Bakerloo Line for the BBC. Kingsway Underpass: A tunnel designed for trams. More Hidden Bits: Some information about some of the disused passages which can be observed in still active stations. Scrap Book is where you can see some additional photographic material that didn't quite make it into the web pages. Finally, if you're a regular visitor, you can see what's changed since you last visited by having a look at the Changes Page - or by clicking on the little blue icon at the top of this page. Underground History is a living document that was started in March 2000. This means that over time more and more should be added to these pages. In other words, bear with me and visit now and again if you're interested in this subject matter, as more material will almost certainly be appearing over time! Also - don't forget to have a go at one of the jigsaws of images found on this site! Note: My original email addresses (that were addressed to the starfury based accounts) have now been replaced by the contact page due to an increase in undesirable unsolicited and quite frankly offensive junk mail. If you send me a request or question, I will respond in due course via email if you provide a valid email address. Disclaimer: Although dedicated to the history and background of the London Underground, these pages have no associations with London Underground, Transport for London or London Transport. I am not an employee of any of these companies and have no direct associations with them or any transport related company. I visited all locations with permission and where appropriate supervision and permits were obtained. I certainly wouldn't advocate any attempt at visiting any of the locations featured on this web site without appropriate clearance. It's illegal and very dangerous. It's not a good idea to pester staff at these locations about visiting - they'll almost certainly say no. Instead, consider joining a specialist society such as Subterrania Britanica, who arrange such visits on a formal basis. Since this site was written, London Transport Museum have created a series of tours unde their Hidden London brand. These are well worth going on. Tower Bridge aerial photograph © 1999 and is used with permission. The photograph was taken late 1999 just as building work was commencing on the south bank (left of the picture) of the Thames. I have no problem with people printing out a copy of these pages for personal use - but remember that I've used white text so you may need to change your browser's print character colour to black. Note that unless otherwise credited, all the images and text on these pages are copyright Hywel Williams. If you wish to use the images or text for any purpose other than viewing on this web page or printing out a single copy for personal use, permission must be sought and granted from myself before re-use is permitted. Use of small amounts of material or images for academic work is allowed under "fair use" guidelines so long as the source of the work is quoted. Please note also that where credited, the copyright of some images used here may belong to others and unless the images are used for personal purposes within the context of this web page, permission may be required from the copyright holder for their re-use. Reproduction of this web site, in whole or in part, on compilation CD/DVDs is a breach of this copyright as is mirroring the site elsewhere on the internet (with the exception of search engine indexing). If you're reading this site anywhere other than http://underground-history.co.uk, please let me know. The only information gathered about visitors to this site are the standard web logs provided by my service provider. Email addresses given in communication are kept in strict confidence and are never used for any purposes or handed on to third parties without the express permission of the sender.